The magic pearl in the iridescent variety of Hutsulshina is adorned with the Putyl region - a corner of the Carpathian Mountains. 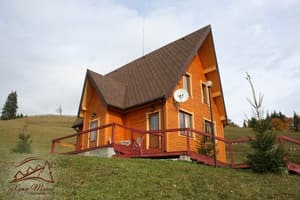 Here lives the Hutsul hospitable, talented, generous people. 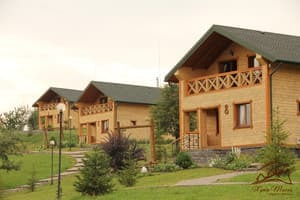 In this magical land, surrounded by majestic mountains and perennial trees, there is a complex of rest and recreation "Farm Tikhiy". 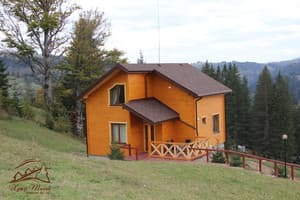 To the services of living 4 cottages equipped with everything necessary for comfortable living - comfortable furniture, kitchenette, bathroom, bedroom, living room, Wi-Fi access. 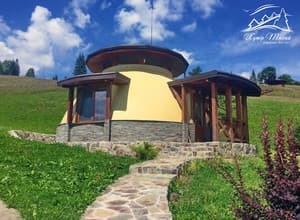 Complex "Khutor Tikhiy" offers its clients a wide range of services: SPA / wellness services (Russian bath, swimming pool, phyto-barrel, pilling, massages, bischofite compresses); Active recreation (riding lessons, mountain biking, hunting, fishing, archery, bench shooting, excursions, trips to the mountains (possibly overnight), rental of skis, sledges, snowtubs, snowmobiles and much more); Sports entertainment (badminton, football, volleyball, board games, etc. ); Children's playground and room; pool. On the territory of the complex there is a mini-zoo and a mini-farm. For those who wish to go to the ski resorts: Bukovel, Migovo, Sokolskoe, Pereval Nemchich. Description of the room: The total area of ​​the cottage is 16 sq.m. Accommodation: 1 main + 1 extra bed First floor: entrance hall, bedroom, bathroom and shower. 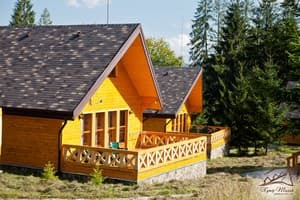 The cottages use systems of autonomous heating and hot water supply. The houses are provided with round-the-clock supply of spring water, suitable for drinking. 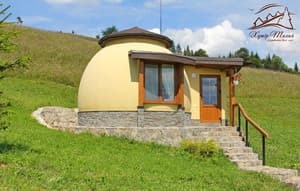 Description of the room: The total area of ​​the cottage is 39 sq.m. Accommodation: 2 main + 2 additional places. First floor: entrance hall, bedroom, sofa, wardrobe, bathroom and shower. The cottages use systems of autonomous heating and hot water supply. The houses are provided with round-the-clock supply of spring water, suitable for drinking. Description of the room: On the first floor there are living room, kitchen, bathroom and a big terrace. The living room is placed a large sofa and chair, wardrobe. In the kitchen all the necessary kitchen equipment. The bathroom is equipped with hairdryer, mini perfumes, shower. 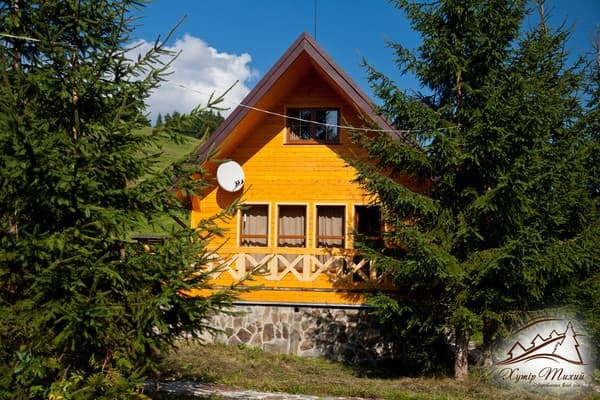 On the spacious terrace you can spend time and enjoy the scenery of the Carpathian Mountains. On the second floor is a bedroom with two single beds that can stand together and make a double bed. Description of the room: The first floor consists of a living room, kitchen and bathroom. The living room has a cozy sitting area, TV with satellite TV and fireplace with wood. The kitchen is equipped with all necessary equipment, but cooking is not provided. The second floor consists of two bedrooms, dressing room and a spacious balcony. One bedroom contains a double bed, and the other - twin. Description of the room: First floor: dressing room, hallway, terrace, kitchen, living room, bathroom and shower, sauna. Second floor: bedroom with twin beds, a double bedroom and a bathroom. The cottage uses autonomous heating system and hot water supply. The house is provided round the clock spring water suitable for drinking. Perhaps delivering two additional seats. Description of the room: First floor: dressing room, hallway, terrace, kitchen, living room, bathroom and shower, sauna. Second floor: bathroom, 2 bedrooms with twin beds, bedroom with double bed. The cottage uses autonomous heating system and hot water supply. The house is provided round the clock spring water suitable for drinking. Не понравилась дорога,вернее, её отсутствие, несмотря на хорошую машину (отдельное спасибо отелю - за трансфер) 120 км ехали больше 3 часов. Это, конечно, не проблема самого отеля :)) Если ты без машины, то привязан в питании только к ресторану ("плата за уединенность"), но готовят вкусно. Из небольших "-": нам посчитали за 3 полных дня дополнительные места, хотя ребята приехали после часа ночи и завтраки им не дали в день приезда. For children under 5 years of age, a room with no extra bed and breakfast is free of charge. Additional place - 300 UAH. Can be ordered for an additional fee - lunch and dinner. 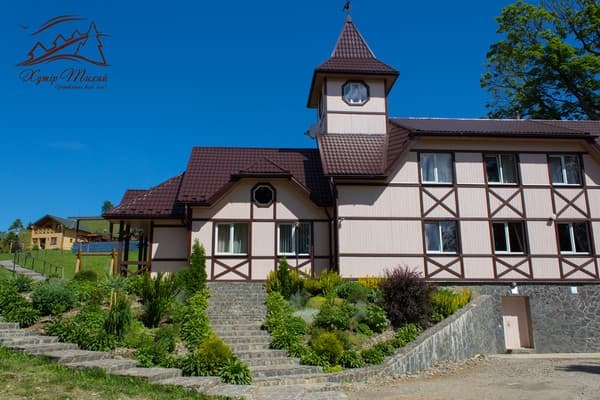 The complex is located 45 km from Vyzhnytsya, 130 km from Chernivtsi, 10 km to the regional center of Putyla. Hippotherapy - treatment with riding. Very useful in the treatment of infantile cerebral palsy, excited posture, scoliosis, osteochondrosis of the spine. By car on the road Chernivtsi - Vyzhnytsya - Verkhovyna (R-62) to the village. Ust-Putyla, turn left after the pointer to Putil. Go about 20 km to the village. Sergii, in the village - to agree on a meeting and on the transfer with the owners. GPS: N: 47.94557 E: 25.13962 By public transport: by train, by bus to the city Chernivtsi. After with AC-1 minibus to Putil. From the city of Putila - by taxi or order a transfer.